Applications: We consider this the best hand-held tube finishing machine available for cleaning, de-rusting, finishing and polishing tubes, pipes and bars. Applications include brushed finishing stainless steel ballustrades, mirror polishing marine fitments, satin finished furniture, finished stainless pipes in food and pharmaceutical industries. It has a good torque and wide speed range enabling a wide range of finishes from coarse to mirror polished to be quickly achieved with the different belts we hold in stock. 270 degree working in one sweep. No need for guide wheels, hence will work easily on bends. 110V version available for on-site use. Fully variable speed to give the correct controlled action. Good torque characteristic avoiding torque ripple at low speeds. Full range of sanding, surface conditioning and polishing belts in stock. Well balanced, handles and belt pressure points well aligned. Vibration 1.99m/s2 (nominal - will vary with speed). 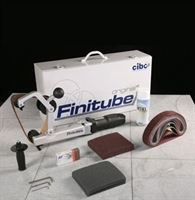 Also Available: We offer a wide range of belts, size 675x40mm to fit FiniTube machines, including sanding, surface conditioning and felt polishing belts.